Isaac Brynjegard-Bialik: Nice Jewish Artist: B'ruchim ha-ba'im. I've decided to start documenting my artwork with this blog -- just a small record of bits of pieces as I go about creating papercuts, paintings, and other art. 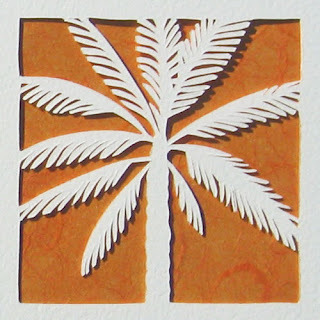 Today: a detail from a ketubah I just completed that features a "seven species" motif; this is a palm tree, representing date honey. All work on this site is copyright by Isaac Brynjegard-Bialik; see more at my website.